Same room, same night, 34,000 points less! You can be sure I made a new booking and cancelled my old one. Now, for a 3,441 point premium, I'm getting the same £75 of value. That means I'm now getting a fantastic 3.25 CPP return on those additional points! 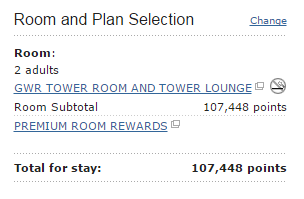 And that's for a room that also includes lounge access. Not a bad deal at all!